Engineers learn from every failure -- except perhaps those in which the evidence of what happened isn't burnt to a crisp on the side of the road. 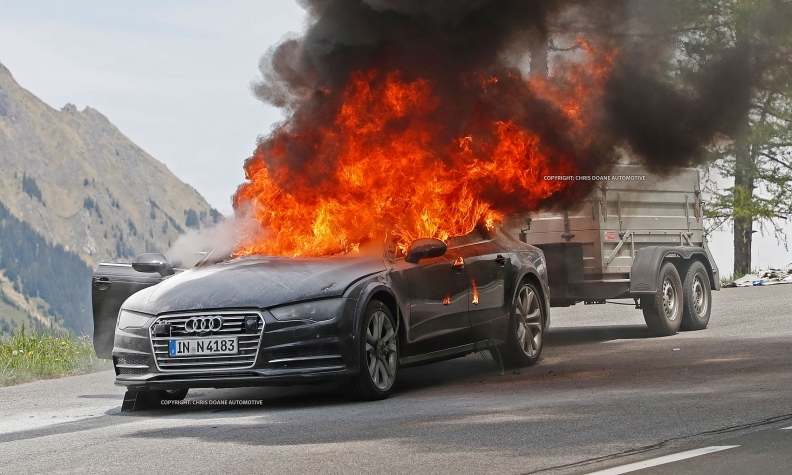 Audi engineers in Europe on Thursday were pulling a dead weight trailer in the thin air and steep climbs of the Austrian Alps with a new A7 sedan when a fire started under the hood. Spy photographers captured the scene as the test crew turned the car around and into a nearby pull-off, then scrambled to remove equipment from the test car. One team member tried unsuccessfully to extinguish the blaze with a hand-held fire extinguisher. The car was soon engulfed in flames and was destroyed within 15 or 20 minutes, witnesses said. A local fire crew arrived and eventually extinguished the remaining flames. The redesigned A7 will debut this fall in Europe.